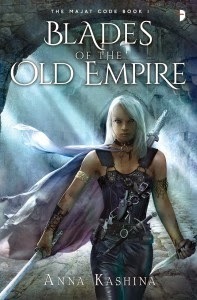 This is a notice to readers that the recently released fantasy book BLADES OF THE OLD EMPIRE is missing chapter 49. To make an unfortunate situation worse, chapter 49 is the end of the book big scene which resolves all the threads. Needless to say the author, Anna Kashina, is devastated. If you have purchased a copy please notify the publisher for a free replacement. You can go to the Angry Robot website to see the details. I'm hoping that everyone else will show Anna how writers ban together in tough situations. Please help spread the word and show your support for BLADES OF THE OLD EMPIRE! You can follow Anna on twitter under @annakashina and hear from her here. Maybe we can make up for some of this accidental misfortune. Kara is a mercenary - a Diamond warrior, the best of the best, part of the Majat Guild. When her tenure to Prince Kythar comes to an end, he wishes to retain her services, but must accompany her back to her Guild to negotiate her continued protection. When they arrive they discover that the prince's sworn enemy, the Kaddim, have already paid the Guild to engage her services - to capture and hand over the prince (who she has grown very fond of). You can find Blade of the Old Empire on Amazon. What a horrible discovery! I'm sure her readers will understand, so hopefully blogs like this and other social media will get the word out about the replacements. That's so awful. It's also disappointing to hear that Angry Robot's editors missed something like that -- or that someone in the production chain did. A couple years ago I pick up Angry Robot's reprint of K.W. Jeter's INFERNAL DEVICES and was horrified on their behalf by how badly proofread it had been. In some sections, as many as one typo to a page showed up. I started to wonder if that was just something stylistic or even Jeter's fault, but then had an older friend show me his copy of a long-out-of-print original edition of INFERNAL DEVICES. No such errors. The takeaway might be that Angry Robot is not as reliable as authors need their publishers to be -- and that's really unfortunate! I hope this gets cleared up, both for Anna's sake with this book, and with Angry Robot Press itself so they can figure out how their system is broken!